Think about the contrast in home design for a moment, a modern piece in a room that’s traditional, a splash of color in an otherwise monochromatic room, or a vintage camera in a high-tech home theater. Contrast makes an impact, whether it’s a subtle choice or a big decision that enhances the ambiance of an entire room. This brings us to white cabinets paired with dark countertops in the kitchen. Its contrast, that more than a few people avoid because they fear it will make space feel smaller and closed in. The reality? 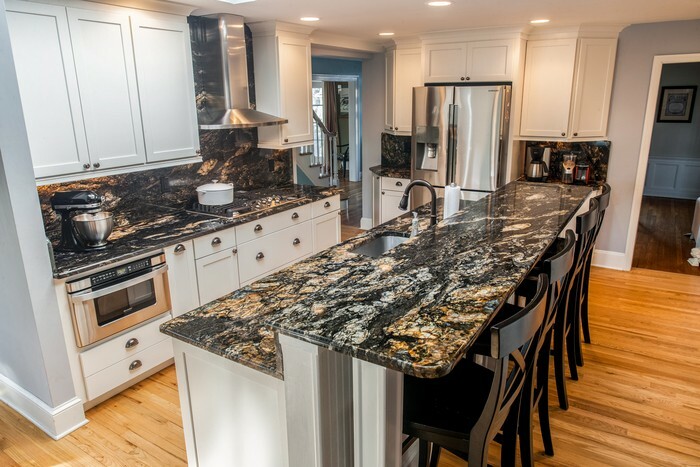 This is a terrific marriage, one that makes a design statement while delivering function as well, whether you choose granite, quartz, onyx, quartzite, travertine, soapstone, or marble. There are more than a few good reasons to choose to bring white and dark together. Let’s say you love the pristine nature of a white kitchen — bright and inviting, it provides a feeling of spaciousness. But, too much white can also be overwhelming, making a kitchen feel cold and sterile instead of warm and inviting. When it is the hub of the home — and let’s face it, the spot where every one of your parties ends up — you want a kitchen that feels welcoming. Dark countertops, whether they are crafted of granite, quartz, quartzite, soapstone, travertine, onyx, or even black marble — will balance the clinical tone of the all-white cabinets. What’s more, the contrast they provide is striking and dramatic. When you pair white cabinets with dark countertops, you also clearly define the space between work areas and storage space. When they are used together, each one highlights the best qualities of the other. Gleaming dark countertops will make finely crafted molding around the cabinets more obvious. At the same time, bright white cabinets turn those countertops into stunning focal points. Place a stunning flower arrangement on a kitchen island to add a burst of color and your kitchen quickly becomes the most striking room in your home. Remember, a dark countertop doesn’t always mean midnight black. Granite, quartzite, quartz, marble, soapstone, travertine, onyx — all are available in deep shades of color with interesting, remarkable patterns. They create contrast with white cabinets and provide plenty of visual interest on their own. 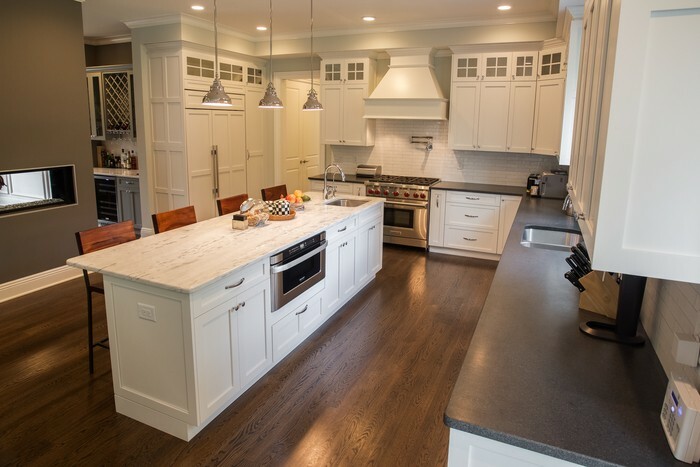 Just look at the veining in this stunning, vast kitchen island — it’s an example of a pattern that manages to not only contrast with the white cabinets but also complement them. When you move design too far in one direction — a kitchen that is nothing but white, for instance — you risk a blandness that can be difficult to overcome. Suddenly, nothing stands out and there is no place for the eyes to land. Once again, think contrast — that’s what the combination of dark countertops and white cabinets can provide. 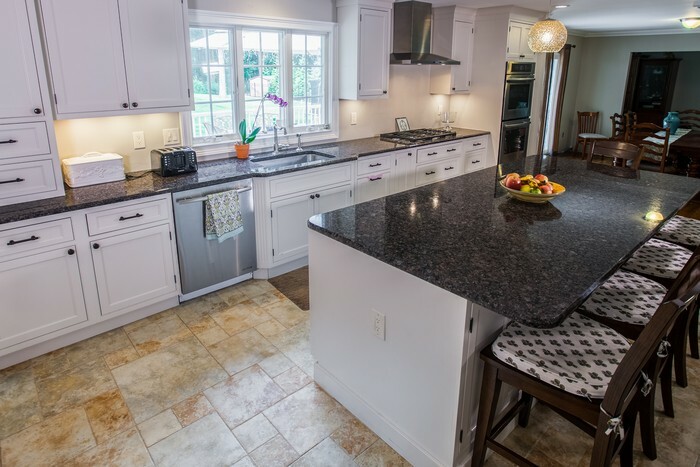 If your first instinct in a kitchen design is white cabinetry — after all, it is easy to favor its fresh, bright and timeless qualities — consider a beautifully crafted, dark-hued material for your countertops. Rather than rule out darker colors, think about the total package and how they can work effectively with the white. And don’t forget that just because a countertop may be a dark color, it can still be polished to a gleaming shine that reflects light. Even if you prefer a matte finish, with a few smart choices in your overall kitchen design, space doesn’t need to be devoid of brightness. Think about what kind of room you want your kitchen to be — most of us want a space that is both striking and welcoming. With timeless white cabinets and bold dark countertops, you can create a room that will deliver exactly what you want.